London: Prime Minister Muhammad Nawaz Sharif Tuesday said that Pakistan and India should hold talks to address their outstanding issues. “I think the hindrance in relations between the two countries is counter productive and it should be removed,” the Prime Minister said while talking to the media persons here on his arrival from Paris. During his two-day official visit to France, the Prime Minister addressed the UN Climate Conference and also held meetings with his Indian counterpart Narendra Modi, Afghan President Ashraf Ghani and British Prime Minister David Cameron on the sidelines of the conference. 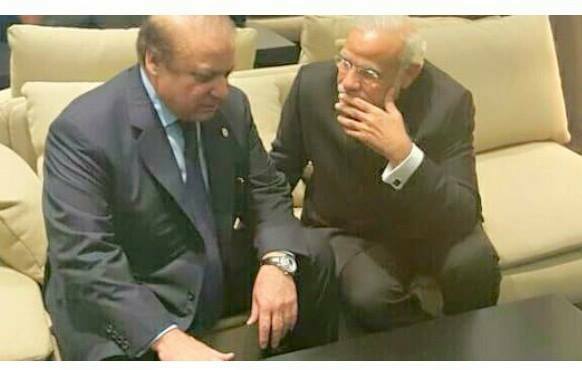 Nawaz Sharif said that Narendra Modi himself came to him at the Paris conference and asked him to further the talks process between the two countries. Improvement in bilateral relations was discussed in the brief meeting. The Prime Minister said terrorists should be eradicated from the entire world and offered Pakistan’s experience to assist the world in the fight against terrorism. He said that operation against terrorists and extremists was not launched on the world’s pressure but Pakistan considered it its moral obligation to start this defining operation. He said the operation would yield good results. To a question, he categorically stated that there were no differences on China Pakistan Economic Corridor (CPEC) in the country. No change had been made in its route and the government was giving full concentration to the western route, where work was in progress, he added. He said the CPEC Project would bring development in the entire region. About local bodies polls in the federal capital, the Prime Minister said the results were encouraging for the PML-N. He said after the issues of electricity and gas were addressed, the country would be on the road to progress with a fast pace.